Two charter schools are hoping to open in 2019 that will divert much-needed funds from our public schools, students, and employees. LCTA supports the recommendation to deny the charter school applications which will negatively impact the majority of the students in Leon County. Therefore, here are some things you can do to show your support. WEAR RED on Tuesday, April 10 to the LCSB meeting to show your support for the recommendation. Note: If you choose to speak at the LCSB meeting, please remember to do so as an individual and not as LCTA. LCTA will have a sign in sheet for all teachers. Let’s see which school can get the most significant amount of participation! There have been questions about respect, civility, and behavior following incidents on school campuses. Below is a list of areas you may like to read to know your rights provided by the LCTA/LCS contract and LCSB policies. Use the links provided to search for the following information. Share what you read and learn with your colleagues. Partial policy language listed below. Visit the website for the full version. The School Board believes that a staff member should be able to work in an environment free of threatening speech or actions. This policy promotes mutual respect, civility and orderly conduct among district employees, parents and the public. This policy is not intended to deprive any person of his/her right to freedom of expression, but only to maintain, to the extent possible and reasonable, a safe, harassment-free workplace for staff members. It is the policy of the School Board to maintain an educational and work environment that is free from all forms of unlawful harassment, including sexual harassment. This commitment applies to all School District operations, programs, and activities. All students, administrators, teachers, staff, and all other school personnel share responsibility for avoiding, discouraging, and reporting any form of unlawful harassment. This policy applies to unlawful conduct occurring on school property, or at another location if such conduct occurs during an activity sponsored by the Board. teasing; threats; intimidation; stalking; cyberstalking; cyberbullying; physical violence; theft; sexual, religious, or racial harassment; public humiliation; or destruction of property. The LCS climate survey focuses on the top five areas of interest to Superintendent Hanna – safety, teacher morale, student achievement, finance/budgeting, and school appearance. LCTA shared your concerns about completing the survey before reappointments and the completion of the instructional practice portion of evaluations. LCS has assured that all responses to this survey will be anonymous. Make sure you encourage your colleagues to complete the survey. Your honest opinion is appreciated and valued. The survey window will remain open until Monday, April 2, 2018. Student safety is practiced and emphasized at the school. Student academic progress is communicated to students and parents regularly. My school's leaders are open to feedback and constructive criticism. I feel comfortable when sharing new ideas and opinions with my school's leaders. The school has clear conduct rules and consequences that are fairly applied. There are four LCTA awards to recognize the work of educators and administrators in Leon County Schools. The deadline for submitting nominations is Tuesday, April 10, 2018, at 5:00 p.m. Any LCTA member in good standing may make submissions. A special thank you to Brian and Daphne McClain for reviewing and editing the documents. Please see the attachments for specific instructions for each award nomination. Thirty LCTA educators wore red and attended the LCSB meeting this past Tuesday, March 27, 2018, in support of not arming educators. The school board, superintendent, and LCS staff recognized our presence. This great start to our “Engage in Excellence” campaign will positively impact LCTA’s membership, negotiations, advocacy, and more. Be sure to look for LCTA”s Wednesday engagement opportunities. This week will focus on committee work. Next week will focus on FEA’s Summer Academy. Have you asked someone to join today? What an outstanding week for Leon Classroom Teachers Association. We conducted our general membership meeting, visited thirteen school sites, and recruited 20 new members. All of these efforts by you has helped bring LCTA’s membership to 851 total members. To put this in perspective, we started the 2016-2017 school year with 648 members. That is an increase of 203 members, and we are not stopping there. Because, if not now, when? So, why are we getting so many members now? Some may say it is because of HB 7055. Others may claim it is because teachers are concerned about their contract. I say it is because of our collective efforts to share the work and goals of LCTA. We are all having conversations. We are all asking our colleagues who are not members to join us in the fight for our profession and traditional public education. We are telling our stories and our vision for what our students and we need to be successful. Thus, to achieve our goal, we must be consistent and deliberate. This is not a sprint but a marathon. We are not trying to hold an event but to change the culture of our organization. However, the question remains, “Will we be there when it counts?” \Will we make it a priority to, say enough is enough? Therefore, this Tuesday is the first chance we have to engage in excellence together, to begin a new habit of being there, and establish a routine of demonstrating our ability to mobilize and bring about change. The LCSB meets this Tues., March 27 to vote on placing School Resource Officers at schools rather than arming teachers. Leon Classroom Teachers Association supports the efforts the Leon County School Board and Superintendent. Here is what you can do to be a part of the evening. Last week we visited thirteen schools. This week our target is fourteen schools. Last week we recruited 20 new members. This week our goal is twenty-two new members. Think of how many face-to-face, one-on-one conversations you had last week. Have one more discussion this week and bring someone to the school board meeting. Before spring break, I had the pleasure of speaking with many teachers. When I asked them if they would be able to make it to the general membership meeting many responded, “I will try to make it.” We will not accomplish our vision for what we know public education should look like and how we need to be treated if we only try. The time for “trying” is over. They’ve taken 3% of your salary. They’ve taken your job security. They’ve forced you into high-stakes testing. They’ve taken your career path. They’ve taken your retirement COLA. They’ve taken resources from classrooms. They’ve taken your planning time. They’ve taken respect for your profession. Now, they’ve taken your voice. Join us. Bring members and potential members with you. Tomorrow, Monday, March 19, 2018 at 5:00 p.m. in the Leon High School Auditorium we no longer try. We do. I wasn’t going to send a News Blast this week. I know you have all worked hard for a much-needed break. However, in light of the passage of the state budget, I did want to make you aware of why we need all instructional staff to attend the general membership meeting on March 19, 2018 at Leon High School. You will hear the total Florida Education Finance Program (FEFP) funding is more than $21 billion, an increase of $484.8 million or 2.35%. However, what they are not saying is that the Base Student Allocation (BSA) is $4,204.42 or an increase of $0.47. Superintendent Runcie of Broward County, where the tragedy of Marjory Stoneman Douglas High School took place, wrote on Twitter, “State budget does not prioritize our students' education. Florida's per-student funding ($7,300) is well below national average (over $11,000); adding a mere a mere 47 cents to per-student is an insult to teachers.” As a state, this means the total funding per student is $7,408.13, an increase of $101.50 or 1.5%. As you can see, a dire situation has become even more stressed. I, by all means, do not have all the answers, but I do know we are stronger together than on our own. The light I see in the darkness you. It is your passion and your ability to use your voice. I hear you when I visit schools. I understand your need to be heard. However, if a transformation is to take place, we must all be committed to the cause. Over spring break, enjoy some downtime with your family and friends. Binge watch a program you’ve been putting off. Recharge, relax and appreciate what we have little time to revel in during the school year because we are focused on our students. Then, meet me at Leon High on Monday, March 19 at 5:00 p.m. I’ll be in the auditorium ready to share information, provide a plan, and listen. On Monday, March 5th, the massive attack on our states students, teachers, and public schools will be up for a FINAL VOTE in the Florida Senate. Call (855) 235-2469 and enter your zip code NOW to be connected with or leave a voicemail for Senator Montford. Thank him for his support of public education and urge him to vote NO on HB 7055. #NOonHB7055. “There is still time for the Senate to stand up to the speaker.” - Joanne McCall, FEA President. On Friday, March 2, 2018, LCTA members, Leon County students and a school board member met with Senator Bill Nelson to discuss what can be done to make sure another tragedy like the one we saw at Marjory Stoneman Douglas High never happens again. 10 LCTA Members gave their opinion about arming teachers, maintaining a trusting environment, and the need for funding and flexibility to meet student needs. Whether you were there in person or responded to the call to action and completed the survey, the senator heard you. Please sign up for additional legislative opportunities here. LCTA has the latest news about the distribution of the various forms of the Best and Brightest. Remember, LCTA and LCS are not pleased about the bonus. The 3.7 million dollars allocated to Best and Brightest could have been a 3% raise for all instructional staff. A raise would have increased the base pay of a starting teacher ($35,600) by $1,068, resulting in an additional $32,040 more in salary over the course of a 30-year career. This is one more example of who you and your work have been devalued over the years. Rather than focus on what could have been, let’s focus on doing what needs to be done to ensure what will be. Join us on March 19, 2018, at Leon High School at 5:00 p.m. to learn how you can be a part of the change our schools and educators need. Sign up to be a part of our bargaining committee here. Get involved legislatively by calling (855) 235-2469 and asking others to join you. What an outstanding week of action! Thank you for your continued commitment to the eternal principals of public education and those who serve to achieve them. Between the commemoration of the 1968 Teacher Walk Out, phone calls and emails to legislators, the legislative charity basketball game protest for public school funding, and the rally for safer conditions for our students and teachers, LCTA and its members are taking action for what is right for students and teachers. Join LCTA on March 19, 2018 for our general membership meeting as we share the work being done and how you can be a part of it (see attached flyer). We must all continue to have a sincere belief in our dignity and worth as educators, professionals, and as productive members of our society. We must share our commitment to excellence in the classroom, the needs of our students, and the working conditions and benefits we know are just and right for the sacrifices we make personally and professionally. Only by staying determined, only by moving forward every day, will we see change and respect returned to our profession. Any student on your roster verification will be used in the calculation of your VAM score. You, not your administrator, should complete the roster submission on the computer. Students who are not matched or qualified may be removed from your class list. Site administration will confirm or deny the roster submission. The teacher of record is the only one who can make changes to a submission. Attached is a more detailed explanation of the process. LCTA Board of Director Brandi Beasley obtained the following information to share with you. The "Best and Brightest" bonus for your evaluation will be distributed in April. LCTA has requested and is still waiting on the specific break down for each category. As soon as we have more information, we will contact the bargaining unit. LCTA welcomes five new members this week! Now, LCTA has reached 100 NEW members this year! However, our work is not done. Take the time to have conversations with your colleagues about why being a member is important to you. Listen to them about their concerns and show them how they can join our LCTA army to advocate for the change they seek. It is the personal one-to-one conversations that build an understanding of the work we do and why it is so important. If you do not have all the answers, it’s OK. I don’t have all the answers. This is why I ask a lot of questions. (My teachers loved me. I was that kid.) Reach out, and we will get you the information but make sure you follow up. While out Saturday night enjoying some time with family, I had the privilege of speaking with a couple about Tuesday’s recognition of the 1968 Florida Teacher Walkout. His mom was a teacher for 30 years at Oak Ridge. They had no idea of the events or the history of why, how, and what resulted from the strike. I realized we are too willing to shoulder in silence the effects of more than 50 years of legislation that has rolled back the accomplishments of these brave men and women. It’s time to say, “No more! Use #bethere4publiced, #50yearpromise, #publicschoolproud, and #NO7055 to flood social media to educate others. Hold unregulated charter management companies accountable for our tax dollars. Give districts the flexibility provided to charters. “Brooks’ mom was one of those teachers that walked out that day. I spoke with her and told her this was happening, and she is overjoyed. She said some of them never got their jobs back. It was her 1st year teaching – amazing. I will definitely be wearing black on Tuesday!” – K. W.
Next week, the Florida Senate will hear HB 7055. The first stop will be the Senate Education Committee on Tuesday, February 20, 2018. The bill still contains the decertification language and many other harmful provisions that undermine our public schools and devalue you as an educator. If you want to attend the committee meeting on Tuesday, email me. LCTA and your affiliates - the only associations working on your behalf and in your interest. 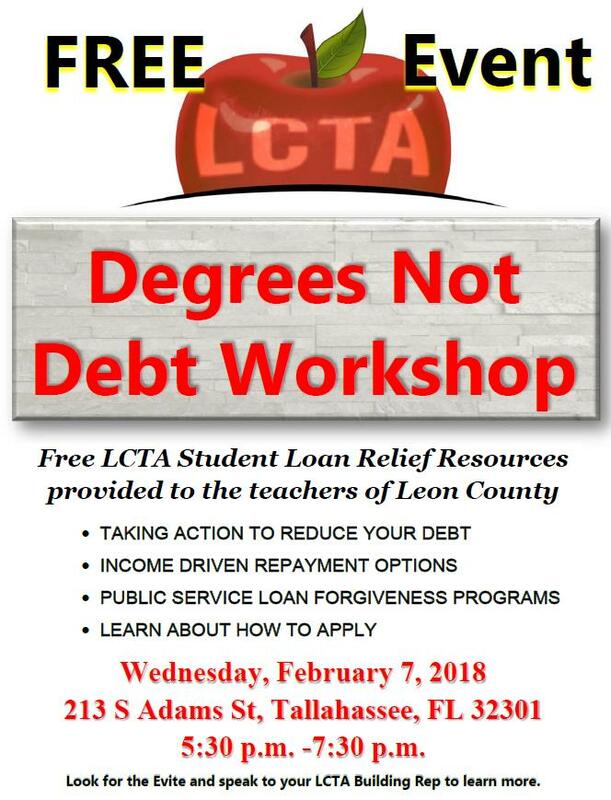 NOTE: Building Representative Meeting - Tuesday, February 20, 2018, @ 5:00 p.m.
· Degrees Not Debt Workshop – Thank you to all of our participants who attended Wednesday’s workshop. Not only was it informative but two of our participants have volunteered to be local presenters of the information! Thank you Adreanna Gimenez and Morgan Brownlee for volunteering. Stay tuned for another opportunity to learn how to address your student loan debt. · Supplement Committee Meeting – As a result of bargaining, the supplement committee began its work this past week. Both LCTA and LCS will implement an educational component to ensure enforcement of the contract. Each school site will have an accessible, consistent, and transparent process. Attached is the current contract language regarding supplements. More information will be shared with your site building rep at the Tuesday, February 20 meeting. Be sure stop by your LCTA board or speak with your rep.
You may not be on strike, but either we go up together, or we go down together. Let us develop a kind of dangerous unselfishness.” – Dr. Martin Luther King, Jr.
Last week, a group of our members visited legislators and attended committee meetings at the Capitol. We all owe a big thank you to Scott Whittle, Adrianne Taylor, Matt Guyton, Shelia Watson, and Zac Johnson for taking the time to share their stories. Although they met with some champions of public education, it was clear to the group that the majority of the legislators do not care about our students, teachers, or community. Talk to your faculty about LCTA. Take LCTA membership applications with you everywhere you go and ask potential members to join. Ask your friends and family to contact our legislator and tell him to VOTE NO on HB 7055. Let him know that you are not willing to give up your seat at the table. We can no longer gripe at lunch and in the halls. We cannot rely on supplements or bonuses to provide for our families. We should not have to worry about which health care plan we choose because our salaries are stagnant. Moreover, we should never have to choose between putting food on the table or supporting our UNION, our VOICE, and our RIGHTS. Enough is enough! The time to stand with LCTA and its affiliates is now! We are the ONLY professional organization working on behalf of the educational professionals in Leon County. The decertification bill which will eliminate your contract and rights has been added to committee bill HB 7055. This Tuesday, January 30, a team of five LCTA members will be at the Capitol advocating on your behalf and learning about the legislative process. If you would like to participate, LCTA will pay for your leave. If interested, reply to scott.mazur@floridaea.org. LCTA is working with LCS to address the inadequate funding and flexibility of local districts which limit the ability of locals to negotiate salary increases. Superintendent Rocky Hanna and I visited the Capitol to share the challenges facing Leon County. We met with staffers for the house appropriations, Representative Loranne Ausley, Representative Ramon Alexander, and Senator Bill Montford. Contact our representatives to thank them for their support of public education and share your challenges as a public school employee. Look for our LCTA/LCS op-ed in the Tallahassee Democrat seeking funding and flexibility. At FEA’s town hall meeting, two teachers were selected for site visits of LCTA members. Those who advocate on our behalf want to know how decisions at the state level are impacting us. 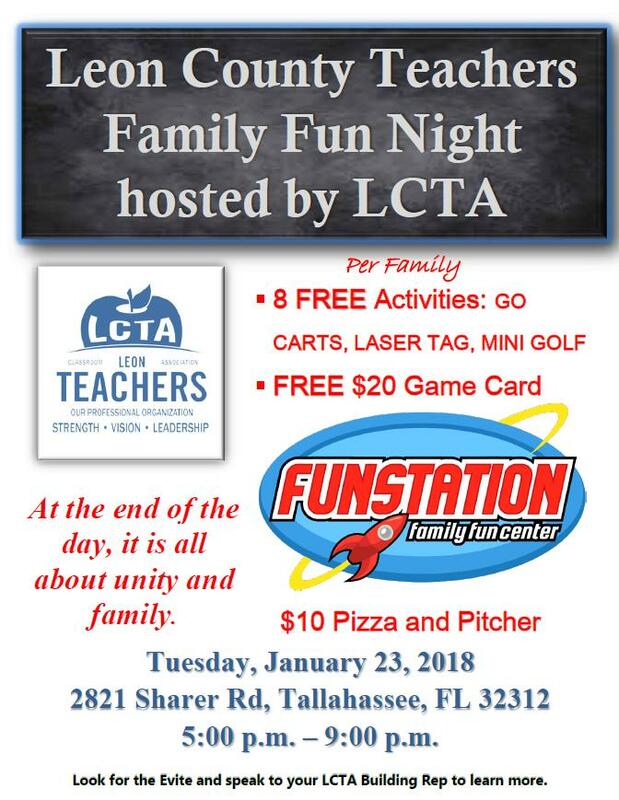 Thank you to the 150 family members of LCTA who joined us for our fist LCTA Family Fun Night at Fun Station this past Tuesday. We look forward to holding a similar event in April. What do you need to know about health insurance? Why are there constant increases? What factors impact insurance increases and decreases? How can I help LCTA and myself address the rising cost? LCTA members have a LARGE discount available via the NEA website. A Jeep priced was almost $5,000 less from the local dealership, before negotiation. This type of discount is available on most local makes and models. Through your union, you also receive discounts on appliances, car rentals, hotels, local restaurants, movie tickets and so many more are there, so be sure to check it all out. I hope you find this information relevant. Of all the things that you can do to make a change, few things are more valuable and beneficial than telling your story. No one can tell your story better than you can. Chances are, you will help others and yourself in the process. The time to act is now. Join the FEA officers in a meaningful discussion that will affect your job and union on Monday, January 22, at 5:30 pm at 213 S. Adams Street. This will also be a good time to talk with state leaders about the issues that matter to you. If you have ever wanted to let FEA know your priorities, attend, listen, and then share. Click here to fill out this survey to confirm your attendance. Those who attend will be entered into a drawing to have one of the FEA officers shadow them for a day at school! Family Fun Night - Click here to sign up! LCTA knows you work hard for the students in our community. Now, LCTA wants you to play hard with your family. Special Meal Deal = $10 pizza and pitcher of soda! In the end, it's all about unity and family! LCTA Challenge: 45 new members a week! LCS has 45 school sites. If we had one person from each site join each week over the next 7 weeks, LCTA would be at 50% membership. Share the value and importance of being a member today. LCTA has 35% membership. We need 50% if HB 25 passes. House Bill 25 is moving through the legislature. It will decertify LCTA as the chief bargaining agent and mean an end to our contract. What could that mean for you? Loss of the whole contract! So much more! Three things you can do. Those who attend will be entered into a drawing to have one of the FEA officers shadow them for a day at school! Inform members and potential members. Have face-to-face conversations. This is not about what Leon County Schools will do. This is not about your site administration. This is not adversarial. This about your loss of your voice. This is about a loss of your bargained rights. Whether you know it or not, LCTA, FEA, NEA, and AFT are the only organizations working to better the learning environment of students and professional conditions of public educators. For more than 20 years, there has been a super-majority in the legislature seeking to gain control over the funding of schools for private gain. The only state organization impeding this progress and protecting us is FEA. When Governor Rick Scott cut public education in 2011 by 1.35 billion dollars, FEA was there to advocate for you and your students. When the FL Legislature eliminated tenure, FEA was there to advocate and explain why it was bad for students and public education. Before House Speaker Corcoran forced House Bill 7069, FEA stopped harmful provisions in committee. There are many more fights that have been fought. Not all of them are public just as all battles in war are not known. However, LCTA will share during the legislative session the fight that is being fought on your behalf. In the meantime, share your story. Don’t sell the union. Let each person find what matters to them, so they choose why they joined. If they will not join now and they show an interest, invite them to join us in the work. Keep them informed. They will see the value. And even if they don’t, they will be helping further the mission and message of LCTA. Learn about HB 25, the union decertification bill. Free activities with you LCS badge! Let's have some fun and learn more about what HB 25 will mean to you and your contract. All LCS employees are invited to attend. From this weekend's Gulf Coast Academy, Family Fun Night (1/23,) Early Career Learning Lab (1/24,) 20 Hr ESE Course (1/27,) Degrees Not Debt Workshop(1/7,) and Insurance Seminar (1/10,) there are many ways you can become more involved in the work of LCTA to further our mission of Community, Advocacy, and Professionalism. Please visit your LCTA bulletin board and see your building rep about the things that matter to you. Also, please attend LCTA’s Building Rep Meeting on Tuesday, January 16, 2018, at Lively in building 1 and have your school represented. The meeting starts at 5:00 PM and is open to all LCTA members. If you are not a building rep, RSVP here. "In our glorious fight for civil rights, we must guard against being fooled by false slogans, such as 'right to work.' It is a law to rob us of our civil rights and job rights. It is supported by Southern segregationists who are trying to keep us from achieving our civil rights and our right of equal job opportunity. Its purpose is to destroy labor unions and the freedom of collective bargaining by which unions have improved wages and working conditions of everyone. Wherever these laws have been passed, wages are lower, job opportunities are fewer, and there are no civil rights. We do not intend to let them do this to us. We demand this fraud be stopped. Our weapon is our vote." The union decertification bill HB 25 was filed and is up for a vote. Now, our “right to work” state is attacking Florida teachers and other public employees who serve the greater good of our community. HB 25 would require 50% membership for unions. At 35% membership, LCTA and your contract would no longer exist. There would be no contract, and you would have no rights. Ask yourself, “ what part of the contract would I like to give back”? Coretta Scott King said the Martin Luther King Jr. Holiday celebrates the life and legacy of a man who brought hope and healing to America. We should celebrate the life of someone who brought hope and healing. We should also honor his sacrifice by emulating his advocacy. We must share our story of hope and healing for public education and those who serve its children because as educators, we have learned to do more with less for too long. We provide hope and healing for our students and community. Our students and we deserve better. I hope everyone had a restful and relaxing winter break. Here at LCTA headquarters, we have been working to ensure the organization increases membership and engages members of the bargaining unit in the work that needs to be done to address our shared priorities. You will see a change in the way LCTA communicates with you and engages you. Weekly Sunday communications will be consistent and targeted to address the two goals of the new year. LCTA is conducting membership development and informational visits throughout Leon County schools from now through the end of the 2017-2018 school year. The purpose of these visits is first to acquaint and then to engage members of the LCTA bargaining unit in the priorities and activities of the Association. To learn how you can become a part of the process, contact your school site’s LCTA Building Representative.